Intuitive Eating is a non-diet approach to health that focuses on our internal cues around hunger, fullness and satiety, while also helping to heal our relationship with food and our bodies. The framework of intuitive eating is broken down into 10 pillars that can be explored in any order, depending on your experience and history with dieting and food. However, the principle of Gentle Nutrition is often saved for last. It might seem counterintuitive (no pun intended) to hold off on talking about nutrition but there’s a good reason for it! 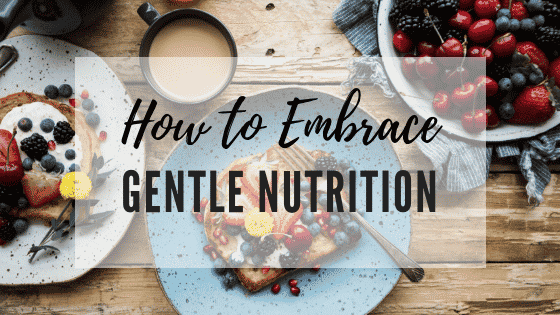 Here we’re breaking down what gentle nutrition means, why it’s saved until later in your intuitive eating journey and how to put it into practice. In fact, two of the most common questions that come in response to learning about intuitive eating as a non-diet approach are: “But what about nutrition?” and “What about my health?” The short answer is that intuitive eating takes into consideration both of those things. It’s an approach that is centered around healing your relationship with food and your body and giving you the freedom to be able to enjoy both nourishing and satisfying foods, without guilt or shame. Why does gentle nutrition come last? Some pieces of intuitive eating are easier to accept than others. “no rules or off-limit foods, and cookies are included?” Sign me up! “I don’t need to track or count points or calories?” Sounds good to me! There’s a lot of unpacking and unlearning that we need to do to truly let go of dieting and embrace intuitive eating. The majority of what we learn about nutrition and health comes from diet culture and dieting messages. We’re taught how to diet but not often taught how to eat for nourishment, satisfaction, or enjoyment. This is the root of our associations and assumptions that healthy eating = dieting. Even though the original definition of diet is ‘habitual nourishment’ the more common way we, and the media, use the term is “eating more ‘good’ foods and fewer ‘bad’ foods to control our health and weight”. All of these dieting and conflicting nutrition messages have made us into food worriers and made us less connected to our internal cues. When we put the focus on external factors of eating, like calories, points, or portion sizes, we lose the understanding of how food actually makes us feel. In fact, research shows a correlation between our attitudes and feelings of stress around foods, and how hard it is for us to listen to our body and enjoy our food. When we start talking about nutrition specifics, even from a non-diet approach, it’s important that that unlearning and processing of the other principles of intuitive eating has had time to sink in first. I like to explain it as diets often lead with nutrition information without regard for what framework and relationship we have with food, so to undo that, intuitive eating starts from the bottom. You first have to rebuild a stable structure and relationship to food, and later can add in the nutrition component. When you’ve made peace with food, tuned out the food police, and are able to make food choices without fear or guilt, then we can work on adding in gentle nutrition. The ‘gentle’ part of gentle nutrition is important and reflective of the flexibility and permission that is so integral to intuitive eating. Whenever we start to have rigid rules around food and health, we’ve moved away from intuitive eating. Having that flexibility and groundwork set up by the other principles is what allows you to truly explore and find what feels good and works for you, individually. The key is that you are making the choices from a place of honoring your health, not from any lingering diet culture motivations. Diet culture sells us on worrying and stressing over individual nutrients and the extreme effects of each aspect of our food choices but really, overall habits and patterns (and aspects aside from nutrition!) are greater indicators of overall health. Yes, we have research to show us that certain foods promote health and can help prevent disease and choosing to incorporate those foods is a great example of gentle nutrition. The idea of zooming out can also apply in filtering nutrition messages from the news and media. When you hear about a new health trend or the next superfood, zoom out and take a step back to think about how this suggestion would fit in and support your relationship with food and health. This isn’t to say that you shouldn’t listen to any health news but to approach those headlines curiosity and knowledge that gentle nutrition doesn’t mean you need to comply with or try every new health trend or fad. Zooming out can also help you look at your overall diet composition and patterns. Are there areas where you’d like to add in more nutritionally dense foods? Times when you’d like to be more flexible around your food choices? Are there times when you’re left feeling unprepared or uninspired with meals or snacks, that you’d like to explore? To ensure that these choices don’t come from a place of restriction or residual diet mentality, it’s important to remember that no one food or meal determines our health, which is also why all foods can fit and support a healthy diet. Think of adding in, instead of taking out. Years of negative food messages can make something like vegetables, fruits or even fiber feel synonymous with dieting. When you’ve reached a point in your relationship with food where you can make decisions from a place of self-care ‘I know vegetables provide me with nutrients that my body needs’ instead of self-control ‘I have to eat vegetables with this meal or else I’m not being healthy.’ Once our choice is coming from a place of self-care, we also have more flexibility to explore new foods and cooking techniques too. If you’ve never craved vegetables, but have gotten to a point where you know all foods can fit and are available to you, trying out different recipes and kinds of vegetables to add to your meals and noticing how they make your body feel can be a great way to practice gentle nutrition. Variety can also come from trying new foods, switching up your seasonings or testing out new recipes. A good starting place for crowding in with gentle nutrition is to look at what you currently eat and see if there are any areas that you might be interested and willing to try to incorporate more nutrition. Just like nutrition isn’t thrown out the window with intuitive eating, a structure around meal planning doesn’t have to be either. Having some framework around meals and snacks can help make the school or work week easier and less stressful by helping you to feel prepared. Think about the general structure of your meal/snack including protein, carbohydrate, fiber and fat. You can also plan on grocery shopping for fun, satisfying foods to keep in the house or have on hands for snacks. If planning ahead is helpful, you could make a list of foods you like in each of those categories and then mix and match to come up with creative meals. Try looking up one or two of ingredients that you have on hand in order to find a recipe idea or inspiration when you’re feeling stuck. The key word here is ‘loose’ structure, meaning not every meal will have each of these components and that’s okay. You don’t need to batch cook and line everything up into identical Tupperware, but having the general structure of how to build a meal that satisfies you and fills you up is part of the process! Read more here as some non-diet RDs share their most helpful tips for meal planning with intuitive eating. If in the past you relied on external cues like serving sizes, food labels or weighing foods to tell you what was ‘enough,’ your internal cues of hunger, fullness and satiety may surprise you. Co-Author of the book Intuitive Eating, Evelyn Tribole says “Portion control is not a problem for intuitive eaters!” Since you are tuning in to what your body wants and needs in that moment, you no longer need to rely on counting calories or feeling tied to a certain portion or amount of food, your body can guide you. Getting enough nourishment can also mean using your ‘brain knowledge’ in combination with your ‘body knowledge.’ There may be times when your hunger cues, or ‘body knowledge,’ are altered, from stress, lack of sleep or not feeling yourself. This can be a time for using your ‘brain knowledge’ or understanding of nutrition and your personal food experiences. Let’s say you have a day full of meetings or your schedule doesn’t have a set lunch break. There may be some days when you don’t feel or notice physical hunger. Even without the physical sensation, we know (brain knowledge) that our bodies feel and work best when we have regular meals and snacks throughout the day. In this case, you could take the time to have packed food ahead of time knowing you had a busy day or go and get something to eat to fuel up and prevent feeling over hungry later on. Dieting creates a feeling of scarcity which contributes to you feeling out of control around certain foods. “If I keep ice cream in the house, I’ll eat it all.” Instead, allowing yourself to have [insert food you don’t keep around for this reason here] in your house, you create abundance which helps your body trust that this food will be available, and you to trust that your body will tell you when it’s satisfied. One of the biggest misconceptions about intuitive eating is that it’s all about eating whatever you want all the time. While it is true that intuitive eating supports you eating foods you enjoy and losing the guilt or shame we’re taught to have around them, there’s more to it than just that. First of all, as appealing as it may seem to have a diet exclusively of freshly baked chocolate chip cookies, it’s not realistic or even as sweet as it sounds. Cookies [or whatever your favorite dessert might be] are delicious, but the idea of them being all you eat is made that much more enticing because we’ve been taught that they’re something we can only have every so often, they’re limited. Since we have this feeling of judgment around them, it makes the idea of them being a staple of our diet all the more appealing and rebellious and plays into the idea of ‘good’ and ‘bad’ foods. Realistically, how do you think you would feel after eating only [insert favorite dessert here – or any one food] all day, every day? Eventually, you’d want something else and that something would probably not be a different dessert. There is no such thing as ‘failing’ intuitive eating or being a ‘perfect’ intuitive eater. It’s a process! As opposed to dieting where there are strict guidelines that show ‘right’ from ‘wrong’ (which we know really just creates more stress and launches into the binge-restrict cycle). Intuitive eating is much more nuanced and so is the incorporation of gentle nutrition. Give yourself the flexibility to learn and grow without judgment as you embrace gentle nutrition. Choosing to have a salad over a burger because you haven’t had many greens recently and you know you feel good when you have some veggies is a valid choice. Diets don’t get to claim the veggies! Choosing a burger over a salad because it’s what you’re in the mood for is also a valid choice. Same goes for all foods. Choosing to have (or not have) a food from a place of honoring your health and your taste preferences, without guilt, represents the growth of your relationship with food, your understanding of what foods feel good to you and how you can incorporate those ideas sustainably into your eating. That’s when making peace with food, gentle nutrition and intuitive eating are in full swing. All other principles of intuitive eating still apply. 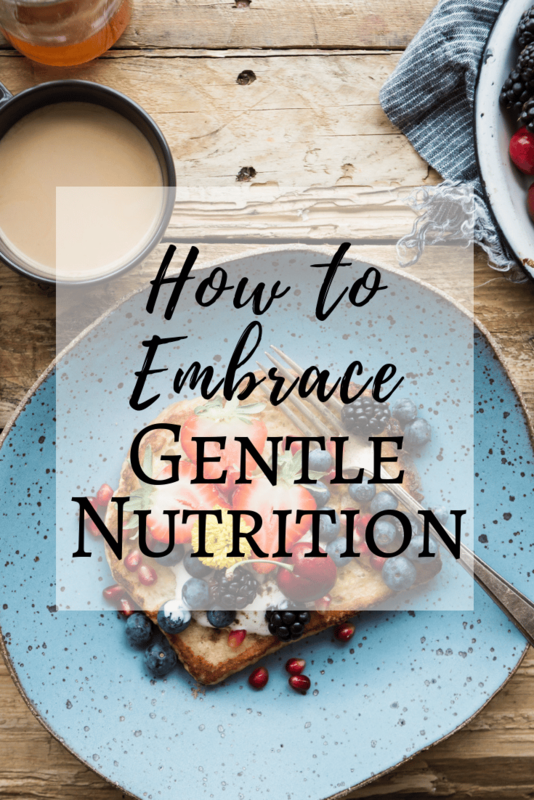 So even when you’re thinking of adding in variety or crowding in more nutritionally dense foods, gentle nutrition comes from a place of enjoying foods, respecting your body and honoring your health – not restricting or obsessing. What’s my ‘why’? Do I really like this food? Do I have any feelings of guilt or diet mentality around this choice? Or did I allow my nutrition knowledge to guide this choice for my health without sacrificing pleasure? Am I putting pressure on myself to be a ‘perfect’ eater? How can I turn to my past work with intuitive eating to explore how to let go of this pressure? Is this choice coming from a place of self-care or self-control? Thanks for your thoughts Elyse! You and Evelyn are such an inspiration and your work has completely changed the course of my career, for which I’m so grateful. I link to the 3rd Ed of the book throughout my site including in this blog post and right up front on my resources page (along with the workbook). Thanks again for all that you do! Love this list!!! As someone that tries to practice IE and is a certified nutritionist, it can be hard to have clear lines and boundaries are my food, what I am learning on a daily basis, and what I teach my clients. Thank you for giving me a clear cut reminder on why IE is so important.